Artful updates for vintage clothing. Above: Julie Miller 1970s drape pocket dress; scalloped waist belt; beaded bangle; gold geometric cuff; wedge sandals. Gustav, “Gateway Piano Lessons,” acrylic on canvas, 144 x 96 inches. Clothing: As Seen on M.E. 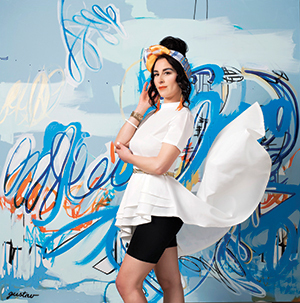 “For as long as I can remember, I’ve been a collector of clothes … and I began to think about what I should do with all of them.” That’s how Megan Evans (pictured, above) describes her motivation for As Seen On M.E., a pop-up and online boutique she created last year that focuses on secondhand clothing. Evans is further motivated by her personal philosophy: Secondhand clothing not only can be stylish, but also represents a socially conscious way to shop. “I started to think about the impact of buying new, fast fashion—from an environmental standpoint and in terms of workers’ rights,” says Evans, who has donated part of the proceeds from her pop-ups to environmental causes. To build As Seen On M.E., Evans has drawn on the creativity of friends, including the ones modeling her thrift finds in this shoot for dsm. Works by Gustav, a collaboration between local artists Ben Schuh and Scott Kaven, provide the backdrop for the vintage looks. As Seen on M.E.’s next pop-up shop will be June 1, from 5 to 8 p.m., in photographer Paige Peterson’s studio at Mainframe Studios. The event also will include a display of works by Gustav. Maggy London 1980s peplum dress; contour harness belt; motorcycle gloves. Gustav, “Sculpture View,” acrylic on canvas, 60 x 60 inches. Lavish Alice sheer overlay jumpsuit; rectangular hoop earrings; mix-and-match rings and necklace. Gustav, “Fractal Transition,” acrylic on canvas, 72 x 96 inches. Taurus II 1990s tuxedo jumpsuit; oversized hoop earrings; cone heels; mix-and-match rings. Gustav, “Blue Explosion,” acrylic on canvas, 60 x 72 inches. EK Designs 1990s gold-pleated turtleneck; Betsey Johnson animal print statement ring; gold collar necklace; mix-and-match bangles and rings. Gustav, “Structure,” acrylic on canvas, 72 x 72 inches. Asymmetrical peplum top; Christian Dior vintage silk scarf; beaded tassel earrings; 1970s chain belt; cycling shorts; mix-and-match bangles. Gustav, “Keo Way,” acrylic on canvas, 72 x 72 inches. 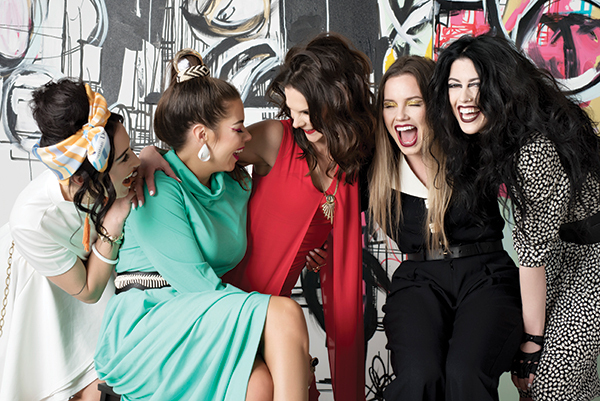 From left: Tatiana Giacinti, Megan Evans, Lindsay Berger, Lacy Brunnette, Joelle Blanchard. 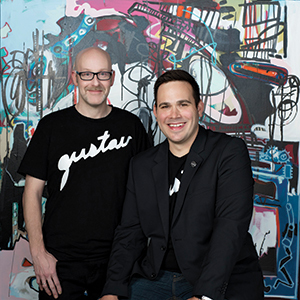 Gustav is a collaboration between Scott Kaven (left) and Ben Schuh. Fashion, beauty and gender find freedom from stereotypes. Simple truths with lifelong value are cherished day by day.